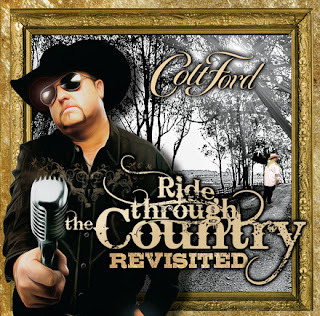 Nashville, TN, Sept. 17, ’13….“Ride Through the Country Revisited,” a celebration of country music star, Colt Ford’s, arrival onto the music scene five years ago, will be released October 1, 2013 on Average Joes Entertainment. The genre-defying debut album contains brand new versions of the hit songs that started it all. Ford talks about the new project on HLN’s “Morning Express with Robin Meade,” Thursday, Sept. 19, at (8:40a.m. EDT). Available everywhere music is sold, pre-order the album here. Fans that pre-order the album instantly receive the newly recorded "Mr. Goodtime" track featuring Ronnie Dunn. Produced by Shannon “Fat Shan” Houchins and Noah Gordon, the new album features both updated and original versions of such hits as “Dirt Road Anthem,” “Ride Through the Country,” “Mr. Goodtime” and “No Trash in My Trailer,” with some very special new guests and music tracks, while remaining true to the first recording. Some of country music’s most respected artists, Ronnie Dunn, Wynonna, Joe Diffie, Charlie Daniels and John Anderson, are featured on “Ride Through the Country Revisited,” joining such stars as Brantley Gilbert, Jamey Johnson and John Michael Montgomery, on Colt's breakthrough, hit record. The album is just pure fun, full of southern, country rock party anthems including the Jamey Johnson co-penned, “Tailgate,” (featuring The LACS), “Waffle House,” an ode to the off-ramp staple (featuring John Anderson), the number one smash hit for Jason Aldean, “Dirt Road Anthem,” (featuring Brantley Gilbert), and the autobiographical, “Mr. Goodtime,” featuring Ronnie Dunn’s unmistakable vocals. Hitting the road nationwide this fall in support of the new album, Ford will take the stage in 34 cities on the Florida Georgia Line, “Here’s to the Good Times,” arena tour. Over the past five years, Ford and his band have performed for more than one million fans from coast to coast delivering honest, real music that connects with audiences on every level.